Abstract–Hamilton, Trivers, and their successors made brilliant contributions to scientific insight. But it’s time to put the selfish gene in its place. Evolution is less dependent on genetic difference and similarity than is generally perceived. In fact, evolution’s most potent trait–the genesis of novelty–depends less than is usually imagined on organism and life. 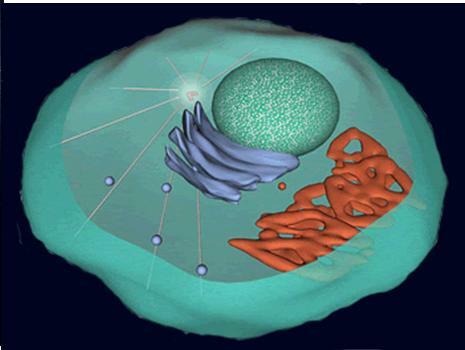 DNA replication is but a special case of something that began with the big bang– the Xerox Effect–the tendency of this cosmos to cough up copies in almost infinite abundance. Natural selection–the need to fit the environment’s constraints–appeared in the Big Bang’s earliest nanoseconds. Evolutionarily Stable Strategies have flourished since the first quarks joined in triumvirates. Variation and competition arose between gaseous macro-clusters long before the first ignition of the stars. Even proto-sociality and large-scale networking are long-standing cosmic legacies. Hamiltonian arithmetic is based on shared heritage, on family. When viewed in terms of protons, suns, and macromolecules, all bioforms are cousins in a single family tree. Planets, dust, and life-forms are all children of the Big Bang. Every living microbe, plant, or animal on Earth is a cousin in the clan of DNA. Every organism that ever was is a relative of its antagonists, of its food, and of the inanimate forces of complexifigenesis and catastrophe. A new way of framing questions and answers emerges when one sees Darwinism, the arithmetic of self interest, and the patterns of the human psyche in the broader context sketched by cosmology, astrophysics, particle physics, microbiology, and paleontology. In this light, it’s time to reevaluate. What traits have we inherited from previous forms of life, and what traits have been bequeathed us by our pre-biotic ancestry? 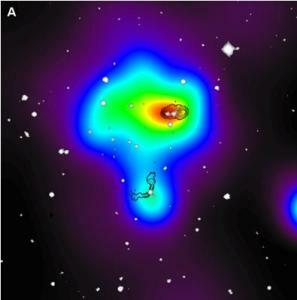 (caption) Astronomers refer to the heart of galaxies as nuclei. Is this an appropriate use of biology’s vocabulary? Or, to put it differently, which aggregation of billions of constituent elements evolved the principle of central control we call nucleation first—galaxies or cells? Evolution is a term used constantly these days by a breed of scientists who seldom if ever deal with the stuff of life—cosmologists, physicists, astrophysicists, and astronomers. They use it to refer to galaxies, suns, and stars. The word “evolution” appears 191,787 times in NASA’s Astrophysics Data System, The Digital Library for Physics, Astrophysics, and Instrumentation hosted by the Harvard-Smithsonian Center for Astrophysics. In other words, physicists and astrophysicists use the word evolution almost four times as often as they use the word “planet” (58,001 times). Are today’s “hard scientists” applying the concept of evolution metaphorically? Are they misappropriating and misusing a term that rightfully belongs to only one form of cosmic interaction—the complex tangle we call life? No. Not at all. Evolution depends on four factors—reproduction, competition, variation, and natural selection. All four factors existed in some form in the pre-biotic universe. All four started their twisting long before life began. early families of particles are known—with all baryons and leptons. Swarms so numerous they defy the human number system cascaded from a spreading sheet of space, time, and energy. All paid tribute to a dead-ringer-generating, identimorphic process of uncanny precision, a process churning out the very same pattern almost everyplace there was a place to be. Was this reproduction? No proton, so far as modern theory knows, ever begat another proton. Nor was this copycat imitation—the mechanism to which theorists like Susan Blakemore attribute the reproduction of memes. In our terms it was parallel or convergent evolution. Evolution�������������������������������������������isn’t that an inappropriate, vitalistic term for the primordial plasma of an abiotic cosmos–one that wouldn’t host a hint of life for another eleven billion years? The mistake, it seems, is made by the biocentric. Once again, evolution’s essence as Charles Darwin saw it boils down to reproduction, variation, competition, and natural selection. Only one of these���reproduction–is a biological monopoly.���� And even that is a shade less clear-cut than it seems. Let���s examine the pre-biotic cosmos for evolution’s remaining trio, its triad of propulsive algorithms–variation, competition, and natural selection–one element at a time. We have strong hints that natural selection has been with us since the earliest second of the Big Bang. Modern physics regards a universe as the product of a set of laws tweaked by roughly 20 variables. What are natural laws? They dictate the way things can and cannot be. Violate the elemental laws, and you can���t succeed. Even if you get away with overstepping the bounds for a picosecond or two, other products of natural law may eradicate you. As of 1999, atom smashers had generated roughly 300 forms of hopeful monsters���subatomic particles.������ Most disappeared within a trillionth of a trillionth of a second. Only a handful could survive the rigors of this particular cosmos at this point in time. This destruction of what doesn’t fit is the ultimate punishment for “unnatural” crime. It’s also the severest form of natural selection. What if the flash of the Big Bang had topped a particle accelerator in inanimate variation, in abiotic fecundity?������ What if it had precipitated 3,000, or three million hopeful genera of particles in its crack-up splat of energy? How many of these early species of proto-matter have survived the fourteen billion years or so since the instant that kick-started time? Only 72. These 72 have made their way through a slew of natural selection’s slings and arrows unparalleled by anything that breathes. They’ve endured the catastrophe of cosmic expansion, the disasters of galactic recompression, the eruption of stellar-center hells, the frigid chill of space, collision, contusion, explosion, intrusion, and the vagaries of ten billion years more time than any thing that ever rose from a mere twitch of RNA. Natural selection worked with extreme ferocity in the first nanoseconds of the Big Bang and in the 300,000 years that followed. The cataclysm physicist Alan Guth refers to as expansion hit with a force that dwarfs the torment at the heart of a nuclear blast. Compression waves repeatedly crushed would-be particles together in a squeeze that makes the mash at the heart of our sun seem like a day at the beach. The heat was beyond belief—it reached 1028 degrees Kelvin, 1021 degrees hotter than the heart of the sun.�� Heat is a measure of speed. Which means that nanobits of primordial matter slammed each other with a destructive force that makes a collision of bullets seem like a polite meeting of snails for tea. 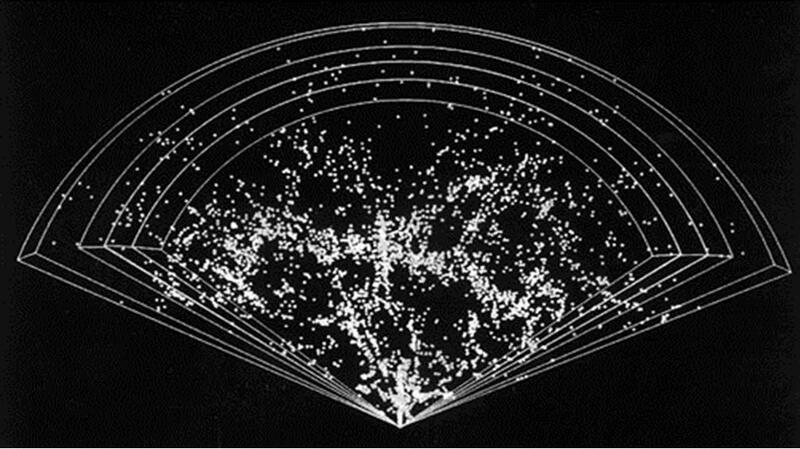 Only 72 forms of elementary particle survived these ricochet-collisions. Only 72 abiotic species made it through this natural selectivity. Even in this harshest of environments, the Xerox Principle worked its ways. Social aggregations by the sesquiviginquintillions gathered in identical patterns and showed their power to stay. They emerged as what Maynard Smith calls Evolutionarily Stable Strategies. The triumphant micro-communities were protons, neutrons, and mesons. Protons were trios of a down quark and two up quarks. Neutrons had the opposite population—one up quark and two down. Mesons were quark duos—quarks in bonded pairs. Despite crashes, smashes, violations, and attacks of outrageous kinds, these huddles of two and three have remained together since the first ten minutes of time. That’s a form of fitness far beyond anything biomass has yet achieved. But perhaps these aggregations’ strangest quality was is its strict adherence to precision and to the Xerox Principle—to identicality. And clenches of three protons flanked by four neutrons (the future cores of lithium). These monomorphic social coveys, too, made it through the slam-dance jam that physicists call a plasma—the superheated smash-em-up that filled the exploding space-time manifold like quivering molten lava for its first 300,000 years. These duos and foursomes showed a power to succeed despite the pounding natural selection meted out even to pre-biotic breeds. And the force-carriers, the radiating, transporting, binding, and repelling particles (some of which are still quite hypothetical)—photons, gluons, W and Z particles, and gravitons. Tossing another twist of variation into the early mix was yet another cleavage between kinds. This separation, this variation, is based on something we in psychology think of as a property that only biomass possesses—behavior, stimulus and response, action based on who’s around you and on what your environment cues you to do. Fermions follow one rulebook of inanimate etiquette—that mapped out by Fermi-Dirac statistics. The cosmic directive fermions obey with strict obedience is this: if one fermion discovers that a nearby other has occupied a given quantum state, it may not crowd into the same quantum niche staked out by its companion. Instead it must assume a different quantum position. The counterparts of fermions are bosons.�� These follow a different set of social do’s and don���ts. The imperatives of bosons are described by Bose‑Einstein statistics. These say that a flock of bosons can hop into the same quantum state and crowd together there quite comfortably. The stimulus-response proclivities of fermions and bosons would not reveal their choreography until the universe was 300,000 years old. But with these social rules there would arise yet another critical evolutionary engine—competition. For at the year 300,000 ABB (After the Big Bang) the environment altered, and it altered drastically. Things cleared up and things slowed down.���� This was the second cosmic EEA. The scalding soup of bump-and-bash spread out. Particles downshifted from a slashing speed to a relative mosey of energy. Space opened in between the trios, duos, and quartets that formerly had crowded in a mash. Photons were no longer trapped in ricochet and for the first time were able to discover their propensity to travel in straight lines. When humans would probe the cosmos fourteen billion years later, they���d sense these straight streams of photons as a subtle radiation, a glow that warms but sheds no light. Bosons were suddenly moved by new social cues. Protons found themselves reeled in by a force of a kind that had never shown itself in quite this way before. They were tugged toward nano-bits one 1,800th their mass. And those tiny particles, electrons, responded to the tugging too. This led to a new circle-dance, a new form of nano-tribe or family. Electrons settled into shells around proton/neutron cores. And these orbiting electrons, being fermions, were polite to each other. No two crowded into the same quantum state. They aggregated yet kept a proper distance, revealing their obedience to the rules of inanimate politesse later traced by the mathematical courtesies mapped by Fermi and Dirac. Thus did particles discover something observers—had there been some–would have found unbelievable. They gathered in the inanimate community we now take for granted and call ���������atoms.��������� Once again, the Xerox Principle held sway. More identical gang-ups sprang up than our words for numbers—from trillions and octillions to duodecillians—can conveniently convey. And they did so not just one-by-one, but yoked in simultaneity. The perpetual swing of a single electron around a single proton—a tango held together by inanimate fascination. This is the particle dance that we call hydrogen. Add a neutron to the center and the swirl’s deuterium. Put a second neutron in, and the frisk is tritium. The swish of two electron circlers around the pivot of two protons and one or two neutrons. These are the particle gavottes we know as helium. The whip of three electrons around a hub of three protons and four neutrons. This is the whisk called lithium. So evolutionarily stable were two of these atom-strategies, so mighty were their powers to overcome potential destroyers like the harsh smack of gamma rays, so hardened to bombardments of natural selectors– that hydrogen and helium atoms passed the ultimate test of fitness—they make up 98% of the matter in this cosmos to this day. Communal intersects of behaviors—of influenced-actions—were behind the startling new emergent properties atoms would display. Since this universe began there had been a mere three forces on display: the strong force, the weak force, and the electromagnetic. Yet there was another great bond-maker, one so weak that in the thickness of a plasma it had never once revealed its possibilities. To an observer accustomed to what nature had been like for 300,000 years, it would have seemed a myth, a ghost, a fairy tale, a fantasy. This new emergent power would add to the Darwinian pistons of variation and selection another crucial evolutionary driver—competition. The force that slowly unveiled its strength now that the cosmos had calmed down a bit was the weakest of the four repellers and compellers. It was the subtlest, yet the grandest of the basic socializers–gravity. Atoms existed but not substances. How could this be? No tug had yet emerged to pull atoms together in a wisp, a tad of dust, a heap. Let’s put it bluntly. Without groups, there would have been no gravitational influence. And without gravity, there would have been no atom mobs, no atom crowds and aggregations, and nothing to compete about. Cannibalism is the word astrophysicists and cosmologists use to describe the new, competitive gravity game. Numbers were power—the more recruits you could attract, the more reinforcements you could dragoon. If your loosely flowing flock of hydrogen or helium atoms had more mass than that of a neighboring gas, you could swallow the wisp whole and add it to your atom congregation. If the multitude of atoms in your dust speck outnumbered the host in a rival fleck, you could haul in the less-populated squad then consume it using gravity���s traction beam. The larger you got, the more neighbors you could attract or shanghai into your pack. When the big felt the attraction of the small, the large swept in the tiny and took all. When wisps and specks were still brand new, the predatory impact of their gravity would have seemed a piffle. But as atom-masses grew they changed the face of darkness, space and time. Long trails of queer, phantasm-stuff���matter– threaded through the black of time and space. Where they crossed they battled to survive each others’ tug. Some hung together through sheer compromise. They swung in ellipses and spirals around fattening hubs of gravitational stuff, protected by their speed—by centrifugal force. They discovered yet another evolutionarily stable survival tactic—orbit—a stratagem whose loops speckled the cosmic map. This was the compromise. The atom-clots that stayed intact as circling captives added their tug to their motion-master���s center of gravity. They upped the grasping power of the globular giant at the heart of their orbital course. The larger the gatherings of circlers and swallowers, the more new niches gravity carved out, and the more new forms and shapes its marauding masses showed. The globular atom-legions that reeled in rival squadrons turned to disks and whorls. Pinprick specks evolved as pinwheels 100,000 light years across. These were the cinder-dark swirls of atoms we call galaxies. Groups of these megadishes duked it out for dominance. Tens of billions of galaxies were drawn together in superclusters that continue to attract and gorge on weaker neighbors to this day. Competing clusters swept the space between them in their capture-matches. This lateral inhibition gave the new clumps spacing. The mega-shapes of circle-laced-with circle turned into an astro-froth, a bubble-stuff of mega-foam whose particles are galaxies. Gravitational sumo matches re-landscaped the flat plain of Einsteinian space/time. They gouged and raised the Van-Gogh patterns in our night-time sky. Gravity was the great aggregator, the great integrator, the great pattern-maker of inanimate sociality. But as yet the sky was dark. Cosmic evolution hadn’t yet discovered the secret of the spark. Variation is a word too tame when something like surprise pops up and changes the very nature of the self-assembling game.�������� The crowding of atoms in the winning gravity centers created an atom smash. Gravity balls grown overfat ignited. They stripped their atom-inhabitants of electrons, mashed proton-neutron groups together—and forced these tortured families of particles to let go of energy. The loss flooded out as photons, and the radiating scatter of debris made light. Roughly 200 hundred million years after the Big Bang, gravity’s variation, natural selection, and competition had pricked through nature’s blackness and had caused stars to ignite. The Xerox effect—mass duplication���������continued to adhere. The hulks that cracked their atoms and spilled photonic refugees were suns. Evolution cookie-cut them by the zillions, each in the shape of a sphere.������ The swirls in which hundreds of billions of suns were wheeled together by gravity were so profoundly similar that they’re easily seen as galaxies. 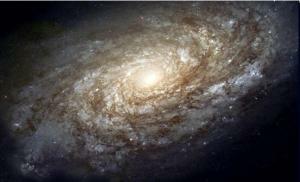 Thousands of herds of galaxies were corralled by gravity. 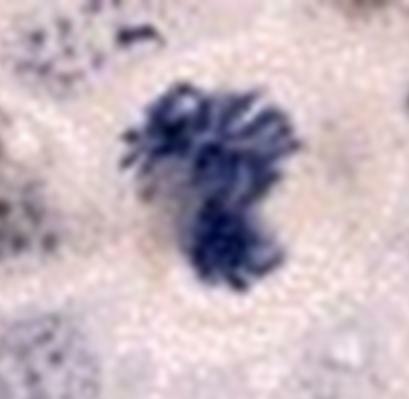 Yet despite their fantastic number, these clusters had a disk-shaped contour that remained at heart the same. Stars, galaxies, and galaxy clusters all are evolutionarily stable strategies. All have proven their ability to endure nature’s nightmares, her selectors, her evolution-honers, her gestation razors. All have triumphed over an environment of star-eat-star and galaxy-eat-galaxy. And all have trillions of lookalikes. All have doppelgangers to the nth degree. (caption) A foam of galaxies. The spaces opened in this lace by gravitationally-powered lateral inhibition are between 60,000,000 to 150,000,000 light-years across. Repetition remained the rule for the next six billion years. Then once again the force Darwin calls variation coughed up a saltative change. Stars spun through developmental phases–youth, maturity, and, finally, old age. The leaping, rebel-jamming, atom-slam that powered stars ran out of energy. The liquid-like inferno at many a star���s heart was squeezed. The core of the star shrunk down, grew cold, and balled up like a fist. Atomic nuclei at the heart grew sluggish and lost the energy to keep their distance, to stay apart. The stellar death-grip multiplied density and, in the presence of trapped nuclei, gave that old attractive force new emergent properties. Catastrophe is opportunity in the world of evolution. Destruction spreads the seeds of new construction. During the years before the first stars died there had only been three basic atom-forms���hydrogen, helium, and lithium. All star-power, no matter where, had come from munching on hydrogen and helium nuclei. The stellar death-squeeze forced these ancient proton-neutron families to accept new social norms, to reluctantly ally in 89 new tribal forms. Four protons forced together would be beryllium. Five protons tortured to unite would be boron. Six would be a wonder at match-making—carbon. Seven would be carbon’s eventual sidekick, nitrogen. Eighty-eight would be the strange and flickery clan called radium. These were proton-neutron tribes created in the midst of supernova devastation. They were huddles, social strategies that would prove their stability in the worst starburst catastrophe this cosmos could toss at them. They were victors on the battlefield of natural selection. The Xerox Effect—synchronicity, duplicative-evolution—the pre-biotic cousin of reproduction—still reigned. So much creativity, and yet so little change. So much novelty and yet so much constraint. Eighty-nine new atom-centers�����yet in a world of 1077 protons, so few. Why for every new atomic core would there be roughly 1055 carbon copies, 1055 dupes? While old stars were dying, new stars were aborning�������evolving by the trillions, yet self-assembling so identically they were indistinguishable as sheep. Star-wannabes self-seeded in patches where the matter-scraps were plenty, and battled nearby rivals gravitationally. Each scoured the dead-star bone yard for more-than-its-fair-share of debris.�� In the clutter that they sucked up there was something new–a smattering of the novel newborn atoms. These were the 89 freshly-scrunched crews of protons and of neutrons—the new elements the rules of duplicative generation, competition, gravitation, and selection had sutured in new forms of sociality. In the new stars������� wakes, inanimate evolution produced another newness unknown in this cosmos’ first few hundred million (and possibly even billion) years—radical new molecules. Raucous jumbles of atom-combinations explored their possibilities. They spat out biomolecules in multitudes, the product of chance and of emergent opportunity. Yet hydrogen and helium were still the rule. Hydrogen and helium, the oldsters in the evolutionary match of slam, crash, join-together, and dance, have shown a hardiness, a fitness, an ability to take on comers of all kinds and stick together. They are still 98% of all we know as gas and matter. The epoch of new-star-and-matter-birth was the third great era of the EEA. All throughout the cosmos nucleic acids, ammonia, and sugars crystallized on spicules of amorphous ice, clumped in slush-and-dustball comets, and discovered their fraternity while mix-and-matching in the stuff of meteorites. Without replication there was iteration. Carbon-copy molecules precipitated with precise identicality billions of light years from each other in the emptiness of space.�� If any found a planet or a moon with liquid water they could do a dance of conjugation and gather in a bubble, in an empty pocket that invited filling.������ Yes, when plunked into a puddle of water, meteorite-born polyols, dihydroxyacetones, glycerols, sugar acids, and sugar alcohols automatically swarm together in the lipid-like-bubble we now call a membrane. Fission and fusion started in the big bang. They appeared in the formation of baryons, in the disintegration of neutrons, in the birth of proto-galaxies, and in the ignition and death of stars. They’ve led to aggregations as small as protons and atoms and as large as galaxy superclusters. Fission and fusion also took place among biomolecules, bacteria, plants, animals, and human clans, and led to aggregations as small as proteins and as large as empires and nations. 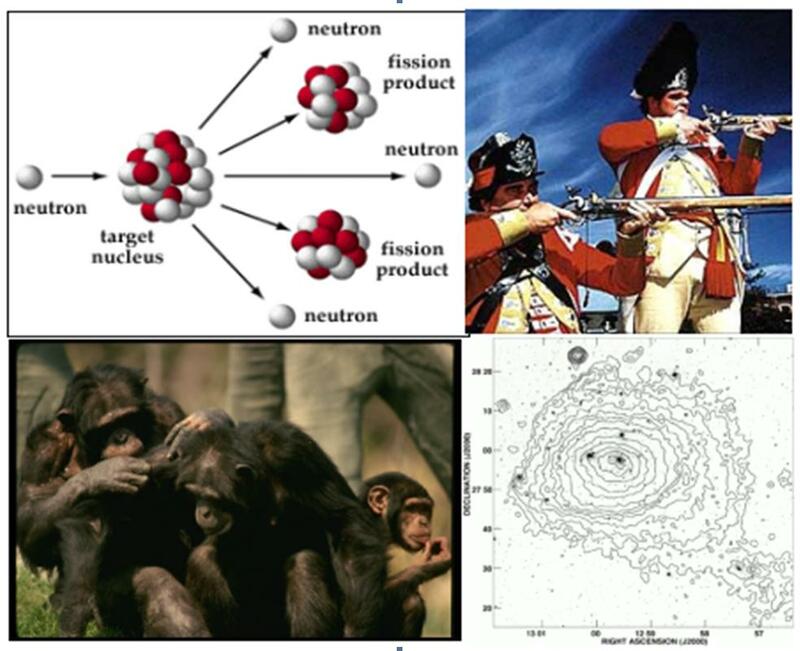 Which first pioneered fission and fusion strategies–protons and galaxies, or bacteria, chimps, and human beings? Are fission and fusion examples of evolutionarily stable strategies, or are they simply sloppy similes? cosmos that’s crawled upward despite the grand disintegrator, entropy. We are mounds of quarks in trios, we are proton-and-electron families. We are children of a repetition, an iterative churning that cookie-cuttered with identical precision long before there was a thing called breathing or the spasm of 100 trillion human cells we call a sneeze. Evolution has crept forward since the first twitch of inflation from a singularity. And so have social strategies. We are the Big Bang’s children. ���� We are containers of the Xerox Principle’s legacy. There is only one life-process on this planet, not the 30 or 3,000 we’d expect if evolution had proceeded in blind randomness. This cosmos can create but is constrained. There are only 92 natural forms of atoms, not the millions that a random cosmos would gestate. There is but a single family on this planet, just one life form stretching out its tendrils, testing possibilities as dust and stars did once upon a time. Face it; we are all in this together, microbes, seaweed, starfish, salamanders, humans, every strange extrusion of nucleic acid chains. We are the kin of yeast, the brothers of cockroaches, the sisters of sugar beets, and the cousins of maize. We share a common birthright born of ancient gene-and-membrane teams. All of us are children in the clan of DNA.